EMERYVILLE, Calif., April 25, 2018 /3BL Media/ – In its “ABC’s of Food Labels,” U.S. non-profit Green America has awarded SCS Global Services’ Sustainably Grown® certification program four and a half stars, among the highest rankings earned by any of the popular global sustainable agriculture ecolabels. This is just the latest recognition received by Sustainably Grown, which covers a comprehensive set of environmental, social, economic, safety and quality attributes related to the production of fresh fruits and vegetables, herbs, nuts, cut flowers, and ornamental plants. 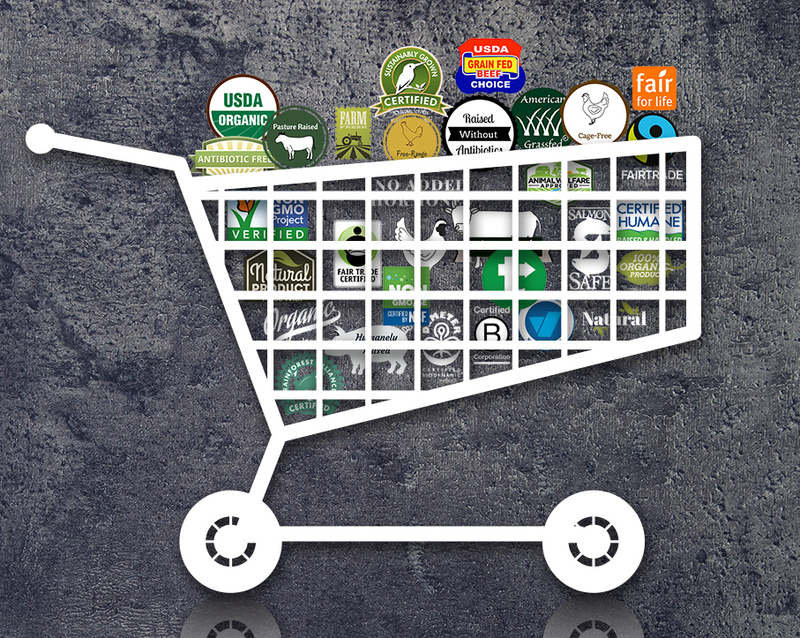 On its website, Green America, whose mission is to “harness economic power—the strength of consumers, investors, businesses, and the marketplace—to create a socially just and environmentally sustainable society,” poses the question: “How do you sort the fact from fiction and get to the bottom of how your food is produced?” This is the question it set out to answer with its rankings of well-known food labels. 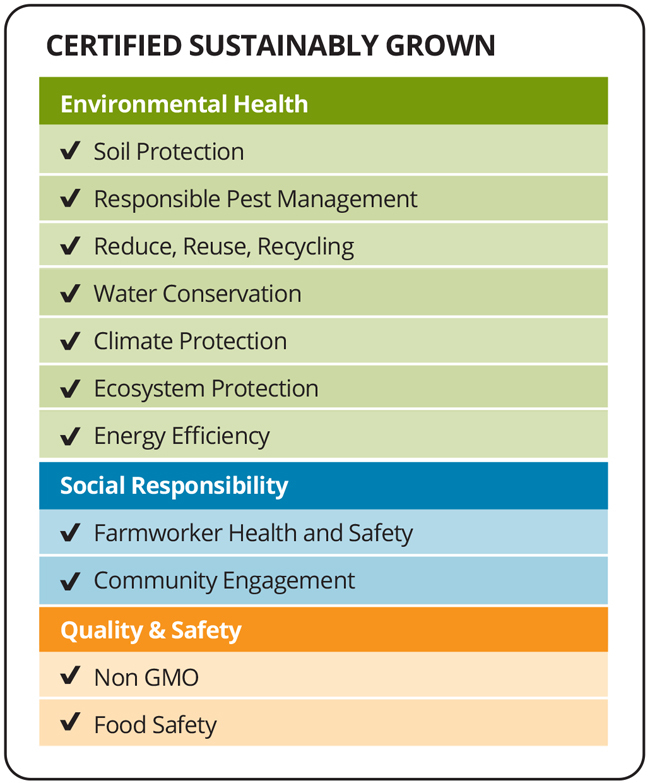 Sustainably Grown addresses a wide range of issues that matter to shoppers, such as responsible pest management, soil protection, water conservation, ecosystem protection, food safety, and non-GMO production. 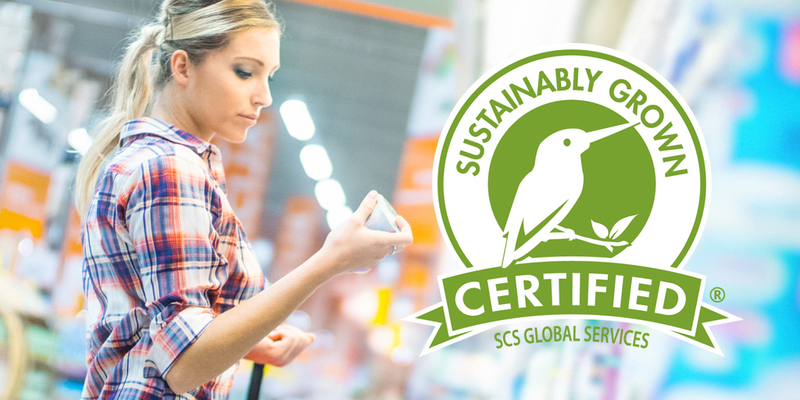 Shoppers were enthusiastic about the third-party certification, and interested in taking steps to learn more about each of sustainability attributes included in Sustainably Grown. Shoppers were willing to pay a moderate price premium for Sustainably Grown products. The Sustainably Grown Kingfisher™ certification logo resonated extremely well with shoppers. An alternative, non-logo-based version of Sustainably Grown certification package messaging designed specifically for retail private label brand use was also well-received by shoppers. Earlier this month, the European-based Sustainable Agriculture Initiative (SAI) Platform and SCS announced the outcome of a benchmarking effort in which Sustainably Grown earned Silver level equivalence to SAI’s Food Sustainability Assessment (FSA) tool, Version 2.0. Sustainable Grown has also been benchmarked to the Global Social Compliance Programme – Europe’s eminent social justice standard – and recognized by the Sustainable Trade Initiative (IDH) under its Sustainability Initiative of Fruit and Vegetables (SIFAV) basket of standards. Major food brands and retailers now include Sustainably Grown in their sustainable sourcing policies. The Sustainably Grown certification program is independently accredited by the American National Standards Institute. About SCS Global Services (www.scsglobalservices.com/sustainably-grown-certification) SCS has been a global leader in third-party quality, environmental and sustainability verification, certification, auditing, testing, and standards development for more than three decades. Its programs span a cross-section of industries, recognizing achievements in energy, manufacturing, green building, food and agriculture, forestry, and more. SCS is a chartered benefit corporation, reflecting its commitment to socially and environmentally responsible business practices, a 2016 recipient of the Acterra Business Environmental Award for Sustainability, and 2017 Business Intelligence Group Sustainability Award. For more information, contact Lesley Sykes at lsykes@scsglobalservices.com, or call 1-510-452-6823.